There is nothing more uncomfortable than bad roots. When you have them, not only do you feel uncomfortable, so do your friends, and so does that judgy girl walking down the street. I used to highlight my hair partially every three months. Highlighting your hair is not cheap. So every three months I would have to go in to get my hair done just because there was a 1/4 inch of roots showing. Fun times. 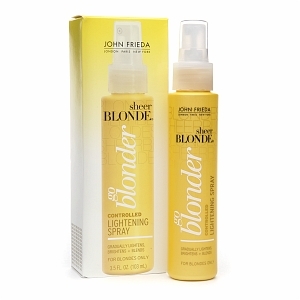 Recently, I was reading a magazine when I discovered John Frieda Lightening Spray. I thought, why not try it, what could go wrong? I used this four times in the course of two weeks, and my roots were gone. If I wanted, I could get my hair done maximum twice a year. For myself and my bank account, that is priceless ...well almost. Disclaimer: Sorry to all brunettes reading this, this will not apply to you directly, but you can pass along this tip to your blonde friends. What are your favorite hair products to use?